Creating objects out of arts and crafts materials is not always about using the common materials that you may find in an art shop, such as fabrics, cardstock, and other items. It can also be about using items from the outdoors such as plant material and other natural elements. Basket weaving is a skill that people have developed over many hundreds of years and is something that can make a basket look wonderful. However, you can effectively use plant materials to weave baskets and make your own plant pots in a number of ways, with a selection of different materials. Those who wish to weave a basket using materials from the outdoors (either to plant things or to use the material to make the plant pots) will have a large selection of different options. 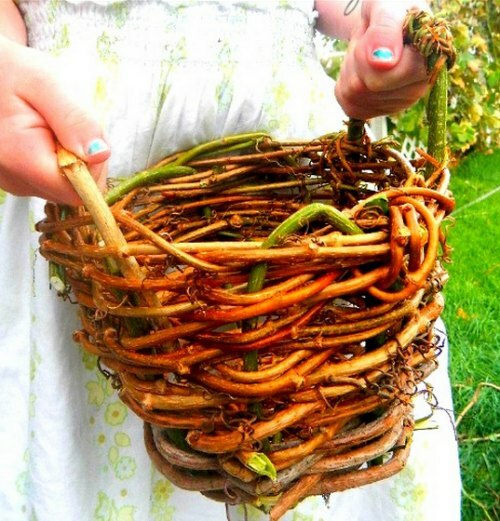 Grapevines or ivy are two of the best choices when using plant materials to create your own woven baskets. They are extremely strong, flexible, and durable, which allows them to last for a long time. They will also continue to develop with age and will become stronger and integrated with the woven structure that is used to make the container. Other plant material such as virginia and mulberry branches are also useful for different components within the woven basket and can be used for components to secure the handles. When you begin collecting your plant material try and select old branches as well as newer and younger plant material. Try to select branches that are at least 3 feet in length and collect as many as you can. You can then begin removing the leaves. In order to weave the branches effectively you will need to create a crisscross effect with the branches—weaving them over and under each other so that they create a dense layer that is strong and tightly interwoven.